(L to R) BoatUS Vice President Jerry Cardarelli, TowBoatUS Baltimore’s Christine Plummer and Capt. Dale Plummer, BoatUS CEO Kirk La and TowBoatUS Vice President Adam Wheeler. A local small business that that helps boaters get safely home was recognized for its professionalism at the BoatUS Towing Services Annual Conference recently held in San Diego, California. 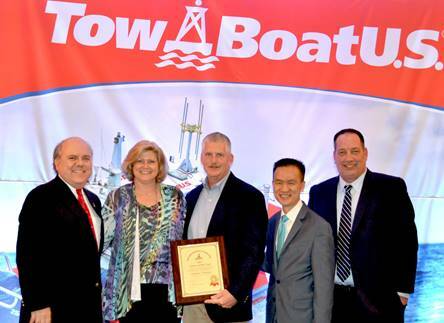 “Tower of the Year” honors went to TowBoatUS Baltimore, which is owned and operated by Capt. Dale Plummer and Christine Plummer. 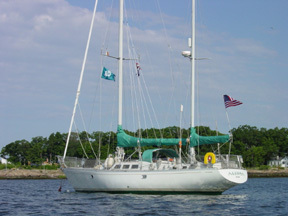 The Maryland company, whose eight, bright red towing response vessels are a familiar sight to Upper Bay boaters, has homeports in Baltimore, Middle River and Annapolis. The Plummers’ company was acknowledged for it’s near-perfect 24-hour towing dispatch operation, superior customer service and satisfaction, towing case management, and its work in the local boating community. Much like an auto club for recreational boaters, TowBoatUS Baltimore is part of a nationwide network of more than 300 locations and 600 towing-response vessels that annually responds to more than 70,000 requests for routine on-water assistance, such as engine breakdowns, running out of fuel or running aground. TowBoatUS Baltimore can be hailed on VHF channel 16, by calling the company directly at 410-255-8700, by phoning the BoatUS toll-free 24/7 Dispatch Center at 800-391-4869, or via smartphone using the free BoatUS Mobile App.